“How come you don’t have anything about Greece ?” said one of my friends (who is half Greek !) yesterday. 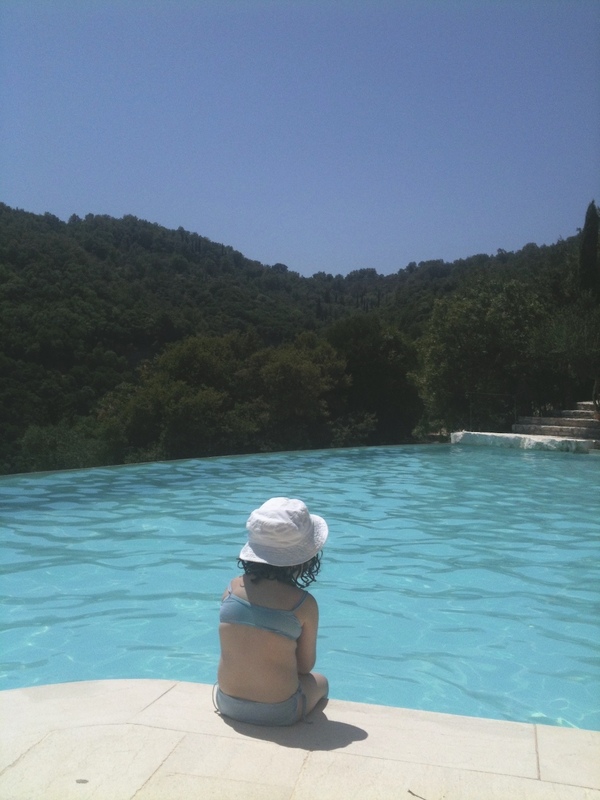 Ah, but that’s because I haven’t had yet time to publish this Rou Estate, review, where we rented a nice villa for our summer holiday in Corfu last year. The Rou Estate is an old village on top of a hill in the beautiful North East of Corfu, where 14 houses have been renovated. The houses share a common swimming pool with plunging view to the sea and the Albanian coast. We had Campanula, a big house with a beautiful garden, a private pool and a separate building where the third bedroom is housed, perfect for a couple of friends with a small child to share or for the grand-parents to come. Because it’s difficult to reach (the last 2 km are on an unpaved road which is not for the shy drivers), there is a real sense of exclusivity. Yet you get a variety of services that really help: a spa and a taverna on site which can bring you cooked meals in the evening. You also get fresh bread and pastries delivered in the morning. It was my 7th holiday in Greece and once again, it was perfect as usual: brilliant sun and heat, good cheap food, clear waters, friendly locals. So get yourself to Greece next summer ! There are smaller houses and only two don’t have a private plunge pool. Look at the pictures on the Simpson Travel site, which markets them, to get an idea of the style as each house has a different decor. Probably better suited for children who are older than 4 years as there are lots of steps, the pool is not watched and you are 15 min away from the nearest village. There are a lot of wasps so if you have an issue with insects, this place won’t be for you. Many beaches have pebbles so make sure to buy appropriate shoes (you can often buy them right on the beach side if you forget them). Do not buy food from the walking merchants on the beach, they sell you fruits at extravagant prices. My friend had advised us to rent a boat and explore the coast. Mademoiselle absolutely adored the speed. I loved jumping off the boat to swim in the clear water and Mr Big fancied himself as a yacht (!!) owner for a day.